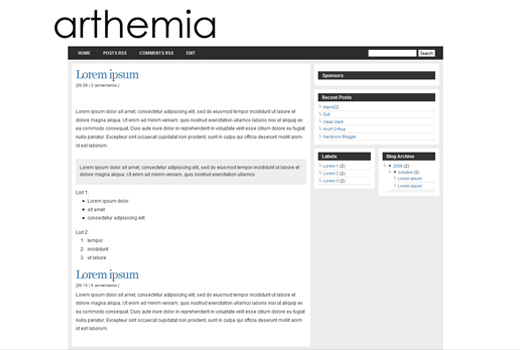 Arthemia Magazine blogger template for free download on Blogger Templates. You would need to upload your own logo image on any free image hosting sites and change the logo image url to yours. Are they not a H1 on the site? hi, i love this design but i want to change the tittle in the black ( home, rss )is possible ? Yes it is possible, go to your blogger dashboard and to Layout -> Edit HTML and do a CTRL + F search for the text in the menu bar like home or posts rss and you will be able to find the links in there, you can change it to the one you like. Try my instructions above your reply, search for the keyword Home and replace the url link there with the url you want to. hi there, i just stumbled your site via google, and i must tell that you compose awesomely good via your site. i am truly struck by the mode that you write, and the subject is excellent. anyhow, i would also like to know whether you would like to exchange links with my website? i will be to the great extent than happy to reciprocate and insert your link on in the link section. waiting for your answer, thanks and gooday! Alright, despite what I read above, I’ve yet to properly modify this banner/header by uploading a replacement. I searched for both logo. pdf or the word Arthemia. And while both showed, I wasn’t sure if the highlighted words were supposed to be the things substituted with the new HTML or what. In any case, I tried to replace both words and anything else that looked like heading/banner section. Anyway, if the user that made this template could advice us on how to easily replace this title/header, I would appreciate it. That, or suggest another site that provides easily editable templates. After that you need to upload your own logo to a free image hosting site, grab the url and replace it with the current one and ur logo will show. Remember to do a CTRL + F5 after that for a hard refresh. I’m having alot of trouble, configuring this onto my own blog page. As when i go to open the arthemia page. i can’t see anything . please help. I just managed to fix the header problem on my blog. If you are using blogger, make sure you have “Expand Widget Templates” checked when you search for the logo.png file, otherwise you won’t be able to find that file in the code. There is only one URL that has logo.png at the end of it so it’s pretty foolproof. Good luck! Hi, how do i take out the “It’s personal” in the header of Arthemia. I was able to change the logo to my personal logo, but the word “it’s personal I cannot find where to take it out. I went to each php files and searched for it but no luck. I even checked all possible png thinking it may be an image as well, but no luck. Please help. Decent layout and design, but a completely incompatible interface, and VERY Blogger unfriendly. There’s not a lot going on with this template, so if you’re looking for a simple Blogger layout, I would highly advise going with another template. There are some major bugs with this one. An fascinating speech is couturier note. I think that you should indite much on this matter, it power not be a inhibition bailiwick but mostly fill are not sufficiency to verbalize on much topics. To the succeeding. Cheers like your Download Arthemia Magazine Blogger Template.